This article is about the upcoming 2019 film. For the 1956 film, see Godzilla, King of the Monsters! For the unproduced film, see Godzilla: King of the Monsters in 3D. Godzilla: King of the Monsters is an upcoming American monster film directed and co-written by Michael Dougherty. It is a sequel to Godzilla (2014) and will be the 35th film in the Godzilla franchise, the third film in Legendary's MonsterVerse, and the third Godzilla film to be completely produced by a Hollywood studio. [Note 1] The film stars Kyle Chandler, Vera Farmiga, Millie Bobby Brown, Bradley Whitford, Sally Hawkins, Charles Dance, Thomas Middleditch, Aisha Hinds, O'Shea Jackson Jr., David Strathairn, Ken Watanabe, and Zhang Ziyi. It is one of Yoshimitsu Banno's last films as executive producer, as he died on May 7, 2017. The sequel was green-lit during the opening weekend of Godzilla, with original director Gareth Edwards expected to return. After Edwards left the project in May 2016, Dougherty, who had been hired in October 2016 to re-write the script with Zach Shields, was announced as the director in January 2017. Principal photography began in June 2017 in Atlanta, Georgia and wrapped in September 2017. Godzilla: King of the Monsters is scheduled to be released on May 31, 2019, in 2D, 3D, Dolby Cinema and IMAX. A sequel, Godzilla vs. Kong, is scheduled to be released on March 13, 2020. The heroic efforts of the crypto-zoological agency Monarch as its members face off against a battery of god-sized monsters, including the mighty Godzilla, who collides with Mothra, Rodan, and his ultimate nemesis, the three-headed King Ghidorah. When these ancient super-species—thought to be mere myths—rise again, they all vie for supremacy, leaving humanity's very existence hanging in the balance. —  Legendary and Warner Bros.
Emma's ex-husband, Madison's father, and an animal behavior specialist. After suffering a loss, Mark has an unfavorable opinion of the Titans, Godzilla in particular. Despite this, he joins a rescue mission along with Dr. Serizawa and Dr. Graham to save Emma and Madison from nefarious forces. Chandler spoke of the film's themes being about "healing the planet". Mark's ex-wife, Madison's mother, a paleobiologist working for Monarch, and inventor of the "Orca", a machine that enables communication with the Titans but can also "potentially control them using their bioacoustics on a sonar level." Unlike Mark, Emma believes that humans and Titans can co-exist peacefully. She and Madison are kidnapped by a mysterious organization interested in her technology, with their own plans for the creatures. Farmiga has described her character as being a "DJ for the monsters", stating, "She has figured out a way to communicate with the creatures..." She also described the film being about "saving the environment." 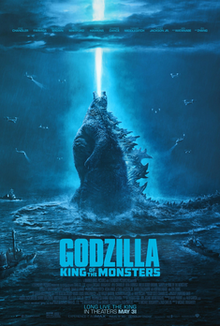 Farmiga noted that while the previous film focused on a father/son relationship, King of the Monsters focuses on a mother/daughter relationship. Due to this, Farmiga believes the film may pass the Bechdel test. Emma and Mark's 14-year-old daughter. She is kidnapped along with her mother and has a connection to Mothra. A scientist working for Monarch. Dougherty verified that Dr. Stanton is loosely modeled after Rick Sanchez from Rick and Morty. Dougherty had the character "drink alot" to keep the character in line with the spirit of Rick Sanchez. A scientist working for Monarch as Serizawa's right-hand. A former British Army colonel and MI-6 agent turned fanatic anarchist, and leader of a terrorist paramilitary group looking to traffic Titan DNA and "level the global playing field". In 2005, he was jailed in a Pakistani prison after attempting to breach the walls of an underground MUTO dig site with a band of accomplice mercenaries. After previously stalking Emma and attempting to raid some of her labs around the world, he takes her and Madison hostage to gain control of Emma's Orca device. Dougherty described Jonah as a mysterious character with conflicting ideas about the Titans' role in the world, believing that mankind has damaged the planet and bringing back the Titans will potentially set things right. The communications liaison between Monarch and the U.S. government. A chief warrant officer who is the leader of the G-Team, the special military forces group run by Monarch specializing in battles involving Titans. An Admiral in the Seventh Fleet of the United States Navy. He is the commander of the United States Navy task force and was previously in charge of tracking down the MUTOs. A scientist working for Monarch. A scientist working for Monarch like her mother and grandmother before her. She is a mythology decoder, specializing in deciphering the mythological backgrounds of the Titans. Additionally, CCH Pounder portrays a senator, Anthony Ramos portrays Corporal Martinez, Elizabeth Ludlow portrays Griffin, and Jonathan Howard portrays Asher, while Randy Havens appears in an undisclosed role. Through motion capture, T.J. Storm reprises his role as Godzilla, while Jason Liles, Alan Maxson, and Richard Dorton portray the heads of King Ghidorah. Liles also portrays Rodan via mo-cap. Gareth Edwards, the director of 2014's Godzilla, stated that he wanted Godzilla to work as a standalone film with a definitive ending, and he opposed suggestions that the ending should leave the film open for a sequel. He said that he had no problem coming back to do a sequel if the film did well, but his main concern was delivering a satisfying experience with the current film, "I want a story that begins and ends, and you leave on a high note. That's all we cared about when we were making this; just this film. If this film is good, the others can come, but let's just pay attention to this and not get sidetracked by other things." After a successful opening of $103 million internationally, Legendary green-lit the Godzilla sequel with plans to produce a trilogy and Edwards attached to direct. At the San Diego Comic-Con in July 2014, Legendary confirmed that they had acquired the rights to Mothra, Rodan, and King Ghidorah from Toho. A short teaser clip showing concept art of all three with the ending tagline "Let them fight" was shown. Other details of their appearances in either of the two sequels were not announced. In August 2014, Legendary announced that the sequel would be released on June 8, 2018, and that writer Max Borenstein would return to write the screenplay. In April 2015, Aaron Taylor-Johnson stated that he was unsure if he would reprise his role for the sequel and that his return depended on Edwards' decision. In October 2015, Legendary announced plans to unite Godzilla and King Kong in a film titled Godzilla vs. Kong, set for a 2020 release date. Legendary plans to create a shared cinematic franchise "centered around Monarch" that "brings together Godzilla and ... King Kong in an ecosystem of other giant super-species, both classic and new." While Legendary will maintain its home at Universal Pictures, it will continue to collaborate with Warner Bros. for the franchise. In May 2016, Warner Bros. announced that Godzilla 2 would be pushed back from its original June 2018 release date to March 22, 2019. That same month, Warner Bros. revealed that Edwards had left the sequel to work on smaller scale projects. Edwards also felt that Legendary "needed to get on with things" instead of waiting for him to finish work on Rogue One but expressed his hope to work on Godzilla again one day. In October 2016, it was revealed that Michael Dougherty and Zach Shields (both of whom worked on Krampus) would write the screenplay for Godzilla 2. A day later, it was reported that Dougherty was also in negotiations to direct Godzilla 2. That same month, Legendary announced that production would also take place at parent company Wanda's Qingdao Movie Metropolis facility in Qingdao, China, along with Pacific Rim: Uprising. While Dougherty loved Gareth Edwards's slow-build, Dougherty revealed that his film will "definitely take the gloves off for this film. No holding back." While comparing his film to Edwards' film, Dougherty stated, "I would call (my movie) the Aliens to Gareth’s Alien." Dougherty elaborated by noting the balance between serious and "fun, tongue-in-cheek moments" from Aliens and that King of the Monsters takes a similar approach. "When [Godzilla] blows his blue flame down the throat of the other creature—a creature we never empathized with in any way—we're empathizing with Godzilla. That's the thing about the movie that I'm most proud of, and I think Gareth did an amazing job pulling that off. I think that's what sets up our Godzilla franchise in a way that the second Godzilla movie can pick up on to begin to make Godzilla a more relatable, emphatic figure. But it needed that groundwork because you don't immediately invest emotionally in something that looks like a giant dragon or lizard." For Dougherty's script, he and his team "started over from scratch". Dougherty began with a rough two page treatment that contained basic beats and rough sketches of the characters. Afterwards, a writer's room was assembled that was ran by Dougherty and co-writer/executive producer Zach Shields. They brought in other writers that contributed to building on the treatment. The script took a year to come together. Dougherty also changed, revised, and improved lines during filming and post-production. Dougherty felt the struggles of writing the script were balancing the monster spectacle "while still creating a story with human characters that we care about." While the previous film focused on Ford with Monarch in the background, Dougherty wanted the film to be focused on Monarch, feeling there was an opportunity to craft the organization as a group of heroes. Due to this, the film became an ensemble piece. "So the concept we’re running with is that this world belonged to them. If anything, we’re the invasive species, and we’ve simply rediscovered something that’s always been there and that they are in some ways, the old gods. The first gods. And that’s something we’re also trying to bring to this film for a more mythological, almost biblical, backdrop to the creatures." —Dougherty on his approach for the monsters. The film retcons the monsters' designation from "MUTOs" to "Titans". For the monsters, Dougherty wanted their designs to emit a Godly presence and evoke a sense of worship, stating, "Primitive man saw these creatures, and you want to give them a presence that would make him drop to his knees and bow to this god…It can’t just look like big dinosaurs. Jurassic Park has that covered. These have to be distinct. They have to be their own thing. They’re Titans." The director instructed the designers to look at the original designs from every era and "distill those silhouettes and those key traits into something more modern." It was important for the director that the Titans were not just simply treated as monsters but "very large animals with a distinct thought process." For Godzilla, Dougherty wished to put back the "God in Godzilla". He liked the design that Gareth Edwards and Matt Allsopp conceived but wanted to tweak it by adding the dorsal fins of the 1954 iteration, as well as making the claws and feet bigger to make Godzilla look like a more powerful predator. The director had the sound design team expand on Godzilla's roar by making it sound closer to the roars of the 1954 incarnation, stating, "I think they did a great job with Godzilla’s roar in the first movie. I pushed them a little bit further to bring it even closer to the (1954) original even more." For Rodan, elements of volcanic rock were added to the scales and skin color to make Rodan look capable of living inside of a volcano. Dougherty wanted Rodan's design to resemble something that "Mother Nature could have created". The designers were instructed to not just look at Pteranodons but at various birds such as vultures, eagles, and hawks due to birds being similar to dinosaurs. Dougherty described Rodan as a "a bit of a rogue... you never quite know where his loyalties lie". The director further described Rodan as a "massive A-bomb" that brings "speed and ferocity". Tom Woodruff Jr. and Amalgamated Dynamics provided the design for Rodan. For Mothra, Dougherty wanted to create something that was "beautiful, and feminine, and elegant, and looked like a true goddess, but also dangerous if she had to be". He attempted to remain faithful to the color palette of the original 1961 incarnation and retaining the eye-spots on her wings. The eye-spots were designed to resemble Godzilla's eyes in order to create a connection between Mothra and Godzilla. Mothra was designed to resemble real moths and given longer legs in order to defend herself against other monsters, another attribute inspired by real moths. Dougherty researched various moth species and discovered some looked "scary" and "predatory". He wished to maintain a sense of realism for Mothra, stating, "So the approach for Mothra is to create an insectoid, huge creature that looks believable from every angle, and especially in motion." The director found Mothra the most difficult Titan to design because he wished to avoid making Mothra look like a blown up moth. Legacy Effects provided the design for Mothra. For King Ghidorah, Dougherty wanted to create a "unique" design that still resembled Ghidorah and worked closely with Toho to make sure the new design respected past incarnations. Each head was given its own personality, with the center being the alpha and the others beings its lackeys. He studied various animals, specifically king cobras, in order to add a sense of realism to the design. The designers were instructed to look at different scales from various reptiles to avoid having Ghidorah's scales looking similar to Godzilla or the original Ghidorah. The director told the design team to maintain an Eastern dragon influence for Ghidorah and to avoid any Western dragon influence, stating, "They’re not traditional western dragons. So those were marching orders from the beginning... We don’t want it to look like Game of Thrones’ dragons." Legacy Effects also provided the design for Ghidorah. While iterating that the film is not a comedy, Dougherty likened Ghidorah to Rip Van Winkle, having a sense of curiosity and cruelty. Producer Alex Garcia described Ghidorah as "not part of the natural order." Dougherty confirmed that the film would feature original, non-Toho monsters. In March 2019, the names of the non-Toho Titans were revealed as Baphomet, Typhoon, Abaddon, Bunyip, and Methuselah. For the roars, the director felt it was important to "getting the noises right" and gave the sound designers a "super cut" of the monster roars from the Shōwa Godzilla films and had them start from there. He confirmed that the monsters would have new roars that will resemble the original incarnations. Dougherty used the Shōwa roars on a massive speaker system to use on-set for scenes where actors had to run from or react to the monsters. In late January 2017, Millie Bobby Brown was the first to be cast for the film, marking it her feature film debut. In February 2017, Kyle Chandler and Vera Farmiga were cast as the parents to Brown's character. In March 2017, it was reported that O'Shea Jackson Jr. was in talks for a role in the film. In April 2017, Aisha Hinds was confirmed to join the cast of the film. In May 2017, Anthony Ramos, Randy Havens, Thomas Middleditch, and Charles Dance were added to the cast, and Sally Hawkins was confirmed to return. At the time, Ken Watanabe was named but not yet been confirmed to return but later, a press release confirmed Watanabe's return for the sequel. In June 2017, Bradley Whitford and Zhang Ziyi were added to the cast, with the latter playing a "major role" in the MonsterVerse. In July 2017, Elizabeth Ludlow was added to the cast. In April 2018, Jason Liles, Alan Maxson, and Richard Dorton were cast to provide the performance capture for the heads of King Ghidorah, with Dorton performing the left head, Liles performing the middle head, and Maxson performing the right head. Other actors will perform the body. Liles also provided the performance capture for Rodan. Principal photography began on June 19, 2017, in Atlanta, Georgia under the working title Fathom. Dougherty confirmed that the film would feature practical effects and creature designs by Tom Woodruff, Jr. Lawrence Sher had been confirmed as director of photography. Parts of the film were shot in the Historic Center of Mexico City between August 19–22, 2017. Dougherty announced the film had wrapped production on September 27, 2017. Visual effects for the film will be provided by Moving Picture Company, DNEG, Method Studios, Raynault VFX and Ollin VFX. Guillaume Rocheron will be the main visual effects supervisor. In November 2018, Dougherty announced that post-production on the film had officially ended. "I've known Michael Dougherty for a long time, as we both run in the same film-nerd circles. I have always appreciated his love of film music, chatting with him for hours on end over the years about the scores we both love. I was thrilled for him when he landed the gig to direct Godzilla, because I knew what it meant to him. When he later asked me to join the project, I was overwhelmed with excitement, and awe, grateful for the chance to join him in contributing to the legacy of our favorite monster. We knew from the beginning that we wanted to incorporate classic [Akira] Ifukube themes, and yet I think fans will be excited to hear how they have evolved. There are some fun surprises in store. Fitting the material and Michael's visionary film, this score is the most massive I have ever written, and I can't wait for fans to experience it!" In November 2018, a sample of McCreary's Godzilla theme was leaked online after it was used during a panel at Tokyo Comic Con. Estimate costs for the film's advertisement range from $100–150 million. In June 2017, Legendary's official Twitter account for Kong: Skull Island began posting videos revealing a timeline and background information of Monarch's discoveries, which teased elements for Godzilla: King of the Monsters and Godzilla vs. Kong. During the 2017 San Diego Comic-Con, Legendary revealed an image of a stone sculpture featuring Mothra, two larvae, and an egg. On July 12, 2018, two first-look images featuring Godzilla unleashing his atomic breath skyward, and Millie Bobby Brown and Vera Farmiga were released, along with a few plot details. On July 18, 2018, a teaser clip was released featuring Millie Bobby Brown and the viral Monarch website went live with documents providing information on the monsters. On July 21, 2018, the first trailer was revealed at San Diego Comic-Con and later released online that same day. In October 2018, Legendary Comics held a panel titled Godzilla: Secrets of the MonsterVerse at the L.A. Comic Con, which presented a sneak peek at the prequel comic Godzilla: Aftershock. In November 2018, a panel for the film was held at the Tokyo Comic-Con where Dougherty revealed concept art, a teaser for an upcoming trailer, and the S.H.MonsterArts figures revealing the designs of the Titans. That same month, Dougherty revealed a new image of Godzilla from the film with a caption from Verses 33 and 34 in Job Chapter 41 from the New International Bible. In early December 2018, teaser clips of Rodan, Mothra, and King Ghidorah from a then-upcoming trailer were released online. On December 9, 2018, a new trailer premiered at Comic Con Experience. On December 10, 2018, the film's first teaser poster and CCXP trailer were released. On December 13, 2018, character posters for Rodan, Mothra, and Ghidorah were released. In January 2019, Dougherty released a new image of King Ghidorah via Twitter. In February 2019, four new character poster of Godzilla, King Ghidorah, Mothra, and Rodan were released to celebrate the Chinese New Year. In March 2019, the film was featured on the cover of Total Film which revealed exclusive photos and information. An extended preview was exclusively presented at WonderCon and CinemaCon. Warner Bros. attached the extended preview to IMAX screenings of Shazam!. In April 2019, the main theatrical poster was released online. On April 21, 2019, the extended preview was released on HBO's streaming services. On April 23, 2019, the final trailer was released online. In October 2018, Legendary announced plans for a prequel graphic novel titled Godzilla: Aftershock. It will be written by Arvid Nelson, illustrated by Drew Edward Johnson and scheduled to be released in spring 2019. In November 2018, the S.H.MonsterArts figures were revealed at the Tokyo Comic-con In February 2019, it was revealed that the film's novelization would be released on May 31, 2019 and the art book The Art of Godzilla: King of the Monsters would be released on June 4, 2019. In February 2019, NECA, Jakks Pacific, and Bandai revealed their toy lines for the film's monsters. That same month, the cover art for Godzilla: Aftershock was revealed. Godzilla: King of the Monsters is scheduled to be released on May 31, 2019, in 2D, 3D, Dolby Cinema, RealD 3D and IMAX by Warner Bros. Pictures, except in Japan where it will be distributed by Toho. The film was originally scheduled to be released on June 8, 2018. However, in May 2016, it was pushed back to March 22, 2019 and then again to its current release date. The film will be released as Godzilla II: King of the Monsters in some markets. The film will also be released in ScreenX formats in some markets. In the United States, the film was given a PG-13 rating for "sequences of monster action, violence, and destruction, and for some language". In September 2015, Legendary moved Kong: Skull Island from Universal to Warner Bros., which sparked media speculation that Godzilla and King Kong will appear in a film together. In October 2015, Legendary confirmed that they would unite Godzilla and King Kong in Godzilla vs. Kong, set for a May 29, 2020 release date. Legendary plans to create a shared cinematic franchise "centered around Monarch" that "brings together Godzilla and Legendary's King Kong in an ecosystem of other giant super-species, both classic and new." Godzilla vs. Kong is scheduled to follow up on March 13, 2020. ^ Millican, Josh (April 15, 2019). "Run Time for Godzilla: King of the Monsters Announced". Dread Central. Retrieved April 15, 2019. ^ a b "Godzilla King of the Monsters goofs up, forgets to remove cameraperson from first clip". Hindustan Times. July 20, 2018. Archived from the original on January 18, 2019. Retrieved December 28, 2018. ^ a b c d e "Warner Bros. Pictures' and Legendary Pictures' MonsterVerse Kicks Into Gear as the Next Godzilla Feature Gets Underway". Warner Bros. (Press release). June 19, 2017. Archived from the original on January 18, 2019. ^ a b c d e Collis, Clark (July 12, 2018). "Godzilla unleashes 'atomic breath' in Godzilla: King of the Monsters first look". Entertainment Weekly. Archived from the original on January 18, 2019. Retrieved July 12, 2018. ^ Cecchini, Mike (March 21, 2019). "Godzilla: King of the Monsters is Bringing Back the Spirit of Toho". Den of Geek. Retrieved March 22, 2019. ^ a b c d e Walkuski, Eric (March 21, 2019). "Set Visit: Everything we learned from the Godzilla: King of the Monsters set". Joblo. Archived from the original on March 22, 2019. Retrieved March 22, 2019. ^ a b Hermanns, Grant (July 11, 2018). "Vera Farmiga Offers Details On Godzilla: King of the Monsters Character". ComingSoon.net. Archived from the original on January 18, 2019. Retrieved July 12, 2018. ^ a b Sciretta, Peter (July 21, 2018). "Bear McCreary Will Compose 'Godzilla: King of the Monsters' Score, Incorporating Classic Themes [Comic-Con 2018]". Slash Film. Archived from the original on January 19, 2019. Retrieved July 21, 2018. ^ Oller, Jacob (March 8, 2019). "King of the Monsters May Be First Godzilla to Pass Bechdel Test, Vera Farmiga Says". Syfy Wire. Archived from the original on March 9, 2019. Retrieved March 9, 2019. ^ "Godzilla 2 King of the Monsters plot details revealed in Total Film magazine scan". Scified. Archived from the original on January 19, 2019. Retrieved October 20, 2018. ^ Leston, Ryan (June 4, 2017). "Godzilla: King of the Monsters adds Bradley Whitford". Yahoo! Movies. Retrieved July 27, 2018. ^ "Monarch Timeline". Scified. Archived from the original on March 24, 2019. Retrieved March 24, 2019. ^ Decker, Sean (March 21, 2019). "Set Visit: Godzilla: King of the Monsters". Dread Central. Archived from the original on March 22, 2019. Retrieved March 22, 2019. ^ GODZILLA KING OF THE MONSTERS MONSTERPALOOZA PANEL WITH DIRECTOR MICHAEL DOUGHERTY. Vimeo. April 14, 2019. 21:19 minutes in. Retrieved April 14, 2019. ^ Marks, Tom (July 21, 2018). "Godzilla: King of the Monsters Will Have Even More than the Four Monsters We Know About - Comic-Con 2018". IGN.com. Retrieved July 22, 2018. ^ SDCC 2018 - Godzilla: King of the Monsters press conference. YouTube. October 21, 2018. 16:50 minutes in. Retrieved October 10, 2018. ^ a b Minow, Nell (July 23, 2018). "Comic-Con 2018: Jason Liles on Playing the Beasts of Rampage and Godzilla: King of the Monsters". RogerEbert.com. Archived from the original on January 19, 2019. Retrieved December 10, 2018. ^ Jones, Brandon (July 22, 2018). "'Godzilla King of the Monsters' trailer reveals the return of Mothra, Rodan, Gamera and King Ghidorah". The Global Dispatch. Archived from the original on January 19, 2019. Retrieved January 19, 2019. ^ Nemiroff, Perri (March 12, 2014). "Gareth Edwards Talks 'Godzilla', Godzilla's Origins, Making Him a Character with Layers, Hints at Additional Monsters, And More". Collider.com. Archived from the original on January 19, 2019. Retrieved February 5, 2017. ^ Busch, Anita (May 18, 2014). "'Godzilla' Sequel In The Works At Warner Bros. & Legendary". Deadline.com. Archived from the original on January 19, 2019. Retrieved February 5, 2017. ^ Kit, Borys (May 22, 2014). "'Star Wars' Spinoff Hires 'Godzilla' Director Gareth Edwards (Exclusive)". The Hollywood Reporter. Archived from the original on January 19, 2019. Retrieved February 6, 2017. ^ Wickman, Kase (July 26, 2014). "Holy Mothra: Gareth Edwards Reveals 'Godzilla 2' Monsters At Comic-Con". MTV News. Archived from the original on January 19, 2019. Retrieved January 19, 2019. ^ a b Lesnick, Silas (August 14, 2014). "Godzilla 2 Stomps Into Theaters June 8, 2018". ComingSoon.net. Archived from the original on January 19, 2019. Retrieved January 19, 2019. ^ a b Fleming Jr, Mike (September 18, 2014). "'Godzilla' Sequel To Be Scripted By Max Borenstein". Deadline.com. Archived from the original on January 19, 2019. Retrieved July 14, 2018. ^ O'Connell, Sean (April 13, 2015). "Will Aaron Taylor-Johnson Be Back For Godzilla 2? Here's What He Says". Cinema Blend. Archived from the original on January 19, 2019. Retrieved April 13, 2015. ^ a b "Legendary and Warner Bros. Pictures Announce Cinematic Franchise Uniting Godzilla, King Kong and Other Iconic Giant Monsters". Legendary Pictures (Press release). October 14, 2015. Archived from the original on January 19, 2019. Retrieved October 14, 2015. ^ Rahman, Abid (May 10, 2016). "Warner Bros. Moves Dates For 'Godzilla 2,' 'Godzilla vs Kong'". The Hollywood Reporter. Archived from the original on January 19, 2019. Retrieved May 10, 2016. ^ Fleming, Jr, Mike (May 13, 2016). "Director Gareth Edwards Exits 'Godzilla 2'". Deadline.com. Archived from the original on January 19, 2019. Retrieved May 13, 2016. ^ "Godzilla 2 – Gareth Edwards on Why He's Not Directing the Sequel". IGN. December 5, 2016. Retrieved May 31, 2017. ^ Kroll, Justin (October 20, 2016). "Michael Dougherty and Zach Shields to Write 'Godzilla 2' for Legendary (Exclusive)". Variety. Archived from the original on January 19, 2019. Retrieved October 20, 2016. ^ Hayes, Britt (October 21, 2016). "Exclusive: 'Godzilla 2' May Be Helmed by 'Krampus' Director Michael Dougherty". Screen Crush. Archived from the original on January 19, 2019. Retrieved October 21, 2016. ^ Galuppo, Mia (October 17, 2016). "Wanda Unveils Plans for $8 Billion 'Movie Metropolis,' Reveals Details About Film Incentives". The Hollywood Reporter. Archived from the original on January 19, 2019. ^ Pedersen, Erik (December 14, 2016). "Legendary Taps Herbert W. Gains As EVP Physical Production, Hires Two SVPs". Deadline. Archived from the original on January 19, 2019. Retrieved December 14, 2016. ^ Kroll, Justin (January 23, 2017). "'Godzilla 2' Finds Director in Michael Dougherty". Variety. Archived from the original on January 19, 2019. Retrieved January 23, 2017. ^ a b c d e f g h Mirjahangir, Chris (March 21, 2019). "Vistiting the Set of Godzilla: King of the Monsters". Toho Kingdom. Archived from the original on March 25, 2019. Retrieved March 25, 2019. ^ a b c d e Nakamura, Satoshi (January 7, 2019). "Interview: Michael Dougherty, Director of Godzilla: King of the Monsters". Tamashii Nations. Archived from the original on January 7, 2019. Retrieved January 7, 2019. ^ Squires, John (December 11, 2018). "Michael Dougherty Says the Approach to 'Godzilla: King of the Monsters' Was "No Holding Back"". Bloody Disgusting. Archived from the original on January 19, 2019. Retrieved December 13, 2018. ^ a b c d e f g Perry, Spencer (March 21, 2019). "From the Set: Michael Dougherty Calls His Godzilla the 'Aliens' of the Franchise". Coming Soon. Archived from the original on March 21, 2019. Retrieved March 21, 2019. ^ Trumbore, Dave (August 10, 2015). "Godzilla 2: Expect a "Bigger" and "Better" Sequel from Screenwriter Max Borenstein". Collider.com. Archived from the original on January 19, 2019. Retrieved August 10, 2015. ^ McKittrick, Christopher (March 9, 2017). ""Every movie is its own beast." Max Borenstein on Kong: Skull Island". Creative Screenwriting. Archived from the original on January 19, 2019. Retrieved March 10, 2017. ^ a b Goldberg, Matt (March 21, 2019). "Michael Dougherty Says His 'Godzilla: King of the Monsters' Is to 'Godzilla' as 'Aliens' Is to 'Alien'". Collider. Archived from the original on March 21, 2019. Retrieved March 21, 2019. ^ Orquiola, John (July 21, 2018). "Godzilla 2 Has Renamed The MonsterVerse Creatures". Screen Rant. Archived from the original on March 21, 2019. Retrieved October 17, 2018. ^ Travis, Ben; Jolin, Dan (March 20, 2019). "Rodan Is Like A 'Massive A-Bomb' In Godzilla: King Of The Monsters – Exclusive Image". Empire. Archived from the original on March 20, 2019. Retrieved March 20, 2019. ^ Millican, Josh (March 25, 2019). "Godzilla: King of the Monsters Producer Reveals Ghidorah "Not Part of the Natural Order". Dread Central. Archived from the original on March 26, 2019. Retrieved March 26, 2019. ^ Briers, Michael (February 25, 2019). "Godzilla: King Of The Monsters Will Feature Original Titans". We Got This Covered. Archived from the original on February 25, 2019. Retrieved February 25, 2019. ^ Borys, Kit (January 27, 2017). "'Stranger Things' Breakout Millie Bobby Brown Set to Star in 'Godzilla' Sequel (Exclusive)". The Hollywood Reporter. Archived from the original on January 19, 2019. Retrieved January 27, 2017. ^ Kroll, Justin (February 21, 2017). "Kyle Chandler to Co-Star as Millie Bobby Brown's Dad in 'Godzilla' Sequel (Exclusive)". Variety. Archived from the original on January 19, 2019. Retrieved February 21, 2017. ^ Kroll, Justin (February 27, 2017). "Vera Farmiga to Star as Millie Bobby Brown's Mom in 'Godzilla' Sequel". Variety. Archived from the original on January 19, 2019. Retrieved February 27, 2017. ^ a b Kroll, Justin (March 27, 2017). "'Straight Outta Compton' Star O'Shea Jackson Jr. Eyes 'Godzilla' Sequel (Exclusive)". Variety. Archived from the original on January 19, 2019. Retrieved March 27, 2017. ^ N'Duka, Amanda (April 18, 2017). "'Underground's Aisha Hinds Boards 'Godzilla: King Of The Monsters'". Deadline.com. Archived from the original on January 19, 2019. Retrieved April 18, 2017. ^ N'Duka, Amanda (May 1, 2017). "Anthony Ramos Books 'A Star Is Born' & 'Godzilla' Sequel". Deadline.com. Archived from the original on January 19, 2019. Retrieved May 1, 2017. ^ a b Barkan, Jonathan (May 24, 2017). "Stranger Things' Randy Havens Has Joined Godzilla: King of the Monsters". Dread Central. Archived from the original on January 19, 2019. Retrieved May 24, 2017. ^ Kroll, Justin (May 31, 2017). "'Silicon Valley' Star Thomas Middleditch Joins 'Godzilla' Sequel (Exclusive)". Variety. Archived from the original on January 19, 2019. Retrieved May 31, 2017. ^ N'Duka, Amanda (May 18, 2017). "'Game Of Thrones' Alum Charles Dance Joins 'Godzilla: King Of The Monsters'". Deadline.com. Archived from the original on January 19, 2019. Retrieved May 18, 2017. ^ Lee, Ashley (June 2, 2017). "Bradley Whitford Joins 'Godzilla' Sequel". The Hollywood Reporter. Archived from the original on January 19, 2019. Retrieved June 2, 2017. ^ Hipes, Patrick (June 8, 2017). "Zhang Ziyi Comes Aboard 'Godzilla' And Beyond". Deadline.com. Archived from the original on January 19, 2019. Retrieved June 8, 2017. ^ N'Duka, Amanda (July 10, 2017). "'Godzilla: King Of The Monsters' Adds Elizabeth Ludlow; Kevin Chapman Cast In 'Slender Man'". Deadline.com. Archived from the original on January 19, 2019. Retrieved July 10, 2017. ^ Verhoeven, Beatrice (April 26, 2018). "'Rampage' Breakout Star Jason Liles Joins 'Godzilla: King of Monsters' (Exclusive)". TheWrap. Archived from the original on January 19, 2019. Retrieved April 26, 2018. ^ White, James (April 26, 2018). "Rampage's Jason Liles Playing King Ghidorah In Godzilla: King Of Monsters". Empire. Archived from the original on January 19, 2019. Retrieved April 28, 2018. ^ Moore, Debi (June 19, 2017). "Filming Kicks off for Godzilla: King of the Monsters in Georgia". Dread Central. Archived from the original on January 19, 2019. Retrieved July 11, 2017. ^ Walljasper, Matt (June 28, 2017). "What's filming in Atlanta now? Avengers: Infinity War, Godzilla, The Passage, and more". Atlanta Magazine. Archived from the original on January 19, 2019. Retrieved July 12, 2017. ^ "Godzilla is 'great opportunity' for Mexico City". BBC. August 21, 2017. Archived from the original on January 19, 2019. Retrieved January 19, 2019. ^ Stephens, David (September 27, 2017). "Godzilla 2 is Officially Done Filming". Screen Rant. Retrieved September 27, 2017. ^ "Godzilla: King of the Monsters - The Art of VFX". www.artofvfx.com. Retrieved October 20, 2018. ^ Zinski, Dan (November 16, 2018). "Godzilla: King Of The Monsters Director Announces The Film Is Done". Screen Rant. Archived from the original on January 19, 2019. Retrieved November 17, 2018. ^ "Bear McCreary to Score Godzilla: King of the Monsters, Will Use Ifukube Themes". Scified. July 23, 2018. Archived from the original on January 19, 2019. Retrieved January 19, 2019. ^ Barder, Ollie (July 22, 2018). "What's Up With The New 'Godzilla: King Of The Monsters' Trailer Using Debussy's 'Clair De Lune'?". Forbes. Archived from the original on January 19, 2019. Retrieved July 27, 2018. ^ Butler, Mary Anne (August 6, 2018). "Bear McCreary Talks Composing for 'Godzilla: King of the Monsters'". Bleeding Cool. Archived from the original on January 19, 2019. Retrieved August 15, 2018. ^ Millican, Josh (December 2, 2018). "Audio from Bear McCreary's Theme for Godzilla: King of the Monsters Leaks Out of Tokyo Comic-Con". Dread Central. Archived from the original on January 19, 2019. Retrieved December 9, 2018. ^ "Kong: Skull Island Twitter Videos Tie Into Godzilla Sequel". SciFi Japan. July 14, 2017. Archived from the original on January 19, 2019. Retrieved July 15, 2017. ^ "Breaking: Godzilla 2 Monsters: Our first look at Mothra". Scified. July 22, 2017. Archived from the original on January 19, 2019. Retrieved July 22, 2017. ^ Goldberg, Matt (July 18, 2018). "'Godzilla: King of the Monsters': First Clip Has Millie Bobby Brown Trying to Reach Monarch". Collider. Archived from the original on January 19, 2019. Retrieved July 18, 2018. ^ Shaw-Williams, Hannah (July 18, 2018). "Here's Every Hidden Secret On Godzilla 2's Viral Website". Screen Rant. Archived from the original on January 19, 2019. Retrieved July 18, 2018. ^ Alexander, Julia (July 21, 2018). "Godzilla: King of the Monsters Comic-Con trailer teases a kaiju-filled sequel". Polygon. Archived from the original on January 19, 2019. Retrieved July 21, 2018. ^ a b Anderson, Kyle (October 25, 2018). "Legendary Announces Godzilla: Aftershock Graphic Novel (Exclusive)". Nerdist. Archived from the original on January 19, 2019. Retrieved October 25, 2018. ^ a b Hermanns, Grant (December 1, 2018). "New Godzilla: King of the Monsters Toys Offer Close Look at the Titans". ComingSoon. Archived from the original on January 19, 2019. Retrieved December 1, 2018. ^ Hood, Cooper (November 28, 2018). "Blue Lightning Illuminates Godzilla in New King of the Monsters Image". Screen Rant. Archived from the original on January 19, 2019. Retrieved December 9, 2018. ^ Hood, Cooper (December 6, 2018). "Godzilla: King of the Monsters Video Reveals New Look At Rodan". Screen Rant. Archived from the original on January 19, 2019. Retrieved December 9, 2018. ^ Squires, John (December 7, 2018). "Mothra's Sounds Will Warm Your Heart in Latest Short Teaser Video for 'Godzilla: King of the Monsters'". Bloody Disgusting. Archived from the original on January 19, 2019. Retrieved December 9, 2018. ^ Squires, John (December 8, 2018). "Ghidorah Rises in Latest 'Godzilla: King of the Monsters' Twitter Tease". Bloody Disgusting. Archived from the original on January 19, 2019. Retrieved December 9, 2018. ^ Weintraub, Steve (December 9, 2018). "'It: Chapter 2′, 'Wonder Woman 1984′, 'Shazam!' New 'Godzilla 2′ Trailer, and More Revealed at CCXP". Collider. Archived from the original on January 19, 2019. Retrieved December 9, 2018. ^ Saathoff, Evan (December 10, 2018). "Godzilla Stomps His Way Onto An Amazing King of the Monsters Poster". Birth.Movies.Death. Archived from the original on January 19, 2019. Retrieved December 10, 2018. ^ Collis, Clark (December 10, 2018). "Godzilla: King of the Monsters trailer teases more giant creature mayhem". Entertainment Weekly. Archived from the original on January 19, 2019. Retrieved December 10, 2018. ^ Collis, Clark (December 13, 2018). "Godzilla: King of the Monsters: Rodan, Mothra, and Ghidorah get own posters". Entertainment Weekly. Archived from the original on January 19, 2019. Retrieved December 13, 2018. ^ Collis, Clark (January 3, 2019). "Godzilla: King of the Monsters: Ghidorah takes flight in monstrous new image". Entertainment Weekly. Archived from the original on January 19, 2019. Retrieved January 4, 2019. ^ Cotter, Padraig (February 6, 2019). "Breathtaking New Godzilla 2 Posters Celebrate the Chinese New Year". Screen Rant. Archived from the original on February 7, 2019. Retrieved February 7, 2019. ^ Maytum, Matt (March 5, 2019). "Exclusive: Titans clash in these new Godzilla: King of the Monsters images, featuring three-headed dragon King Ghidorah". Games Radar. Archived from the original on March 5, 2019. Retrieved March 5, 2019. ^ Brown, Tracy (March 30, 2019). "WonderCon 2019: New 'Annabelle' trailer, 'Godzilla' footage and 'Shazam!' wow for Warner Bros". Los Angeles Times. Archived from the original on April 4, 2019. Retrieved April 4, 2019. ^ Hood, Cooper (April 2, 2019). "Godzilla: King of the Monsters CinemaCon Footage Description". Screen Rant. Archived from the original on April 4, 2019. Retrieved April 4, 2019. ^ Julian, Mark (April 3, 2019). "Extended Preview Of Godzilla: King of the Monsters To Play Before Shazam!". Anime Mojo. Archived from the original on April 4, 2019. Retrieved April 4, 2019. ^ Collis, Clark (April 18, 2019). "Godzilla breathes atomic fire in new King of the Monsters poster". Entertainment Weekly. Archived from the original on April 18, 2019. Retrieved April 18, 2019. ^ Collis, Clark (April 21, 2019). "Godzilla faces off against King Ghidorah in new King of the Monsters footage". Entertainment Weekly. Archived from the original on April 21, 2019. Retrieved April 21, 2019. ^ Goldberg, Matt (April 23, 2019). "Final 'Godzilla: King of the Monsters' Trailer Unleashes the Beasts". Collider. Archived from the original on April 23, 2019. Retrieved April 23, 2019. ^ Webster, Chris (February 7, 2019). "Exclusive Cover Reveals: "The Art of Godzilla: King of Monsters" and Official Novelization". Bloody Disgusting. Archived from the original on February 7, 2019. Retrieved February 7, 2019. ^ "Godzilla: King of the Monsters Figures from NECA". SciFi Japan. February 16, 2019. Archived from the original on February 17, 2019. Retrieved February 17, 2019. ^ "JAKKS Pacific Globally Launches New Godzilla Toys Inspired by Warner Bros. Pictures' and Legendary Entertainment's Godzilla: King of the Monsters". SciFi Japan. February 16, 2019. Archived from the original on February 17, 2019. Retrieved February 17, 2019. ^ "Godzilla: King of the Monsters Figures From Bandai". SciFi Japan. February 25, 2019. Archived from the original on February 25, 2019. Retrieved February 25, 2019. ^ Squires, John (February 25, 2019). "Check Out Cover Art for 'Godzilla: Aftershock,' the Graphic Novel Prequel to 'King of the Monsters'". Blood Disgusting. Archived from the original on February 25, 2019. Retrieved February 25, 2019. ^ Schaefer, Sandy (May 23, 2018). "Godzilla 2 & The Shining Sequel Get New Release Dates". Screen Rant. Archived from the original on January 19, 2019. Retrieved May 23, 2018. ^ McNary, Dave (May 10, 2016). "'Godzilla 2' Moved Back to 2019, 'Godzilla Vs Kong' Set for May 2020". Variety. Archived from the original on January 19, 2019. Retrieved May 11, 2016. ^ Mueller, Matthew (July 24, 2018). "'Godzilla: King of the Monsters' Has a Different International Title". Comic Book Movies. Archived from the original on January 19, 2019. Retrieved August 3, 2018. ^ Hyo-won, Lee (January 16, 2019). "Warner Bros.' 'Shazam!,' 'Godzilla: King of the Monsters' to Get ScreenX Format Releases". The Hollywood Reporter. Archived from the original on February 5, 2019. Retrieved February 5, 2019. ^ Miska, Brad (September 12, 2018). "Godzilla: King of the Monsters Receives a PG-13 Rating". Bloody Disgusting. Archived from the original on April 16, 2019. Retrieved April 16, 2019. ^ Fleming Jr, Mike (September 10, 2015). "King Kong On Move To Warner Bros, Presaging Godzilla Monster Matchup". Deadline.com. Archived from the original on January 19, 2019. Retrieved September 10, 2015. ^ Masters, Kim (September 16, 2015). "Hollywood Gorilla Warfare: It's Universal vs. Legendary Over 'Kong: Skull Island' (and Who Says "Thank You")". The Hollywood Reporter. Archived from the original on January 19, 2019. Retrieved September 17, 2015. ^ Pedersen, Erik (February 21, 2019). "Warner Bros Dates 'Space Jam 2', Shifts 'Annabelle' Sequel & 'Godzilla Vs. Kong'". Deadline. Archived from the original on February 21, 2019. Retrieved February 21, 2019. ^ The U.S. versions of Godzilla (Godzilla, King of the Monsters! ), King Kong vs. Godzilla and The Return of Godzilla (Godzilla 1985) featured additional footage with Western actors shot by small Hollywood production companies that merged the American footage with the original Japanese footage in order to appeal to American audiences. Invasion of Astro-Monster was the first Godzilla film to be co-produced between a Japanese studio (Toho) and an American studio (UPA). The first Godzilla film to be completely produced by a Hollywood studio was the 1998 film of the same name.